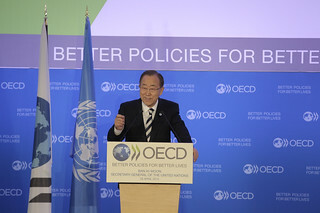 28/04/2015 – United Nations Secretary-General Ban Ki-moon today called on OECD governments to ensure that a series of major summits this year result in a new era of sustainable development. In a speech at the Paris-based OECD, Ban said that agreeing on a new set of Sustainable Development Goals - including financing, and a global agreement on climate action - would require full engagement and leadership from the Organisation’s 34 member countries. Ban called for three essential outcomes from next July’s UN Conference on Financing for Development in Addis Ababa, Ethiopia: a cohesive financing framework for the new SDGs, concrete deliverables on infrastructure and social needs and a strong follow-up process. “Global savings are plentiful, but current investment patterns do not deliver sustainable development. The Addis Conference on Financing for Development is a unique opportunity to change this trajectory,” Ban said, noting that more needs to be done to raise domestic tax revenues in poor countries and attract private investment. “The OECD has a leadership role in many of these areas. And I trust that you will undertake every effort to make Addis Ababa a success,” Ban said. Ban, accompanied by Mr. Wu Hongbo, the UN Under-Secretary General for Economic and Social Affairs, earlier met privately with OECD Secretary-General Angel Gurría to discuss the Addis Conference, the UN Special Summit that will adopt the post-2015 development agenda and the end-year COP21 climate summit. Gurría said that while the OECD would continue to press for more and better aid to poor countries, it would also remain at the forefront of efforts to look beyond aid for other ways to support development. “I look forward to our rich discussions on these issues in Addis Ababa,” he said (Read the full speech).